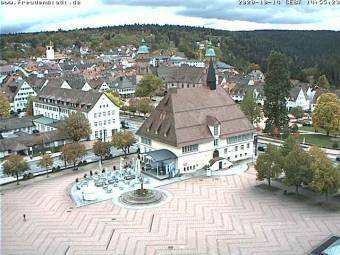 Webcam Freudenstadt: Several Views - Several webcams offer a view of Freudenstadt, Black Forest. Alpirsbach: Black Forest Webcam, 8.1 mi. Oppenau: Maisachtal, Black Forest, 8.8 mi. Ruhestein: Ski Lift Ruhestein, 11 mi. Fluorn-Winzeln: Weathercam Winzeln, 11.6 mi. Seebach (Baden): Mummelsee, 13.4 mi. Ottenhöfen im Schwarzwald: View of Ottenhöfen, 13.9 mi. Unterstmatt: Zur grossen Tanne Unterstmatt, 14.8 mi. This webcam Freudenstadt with the theme Collections was added on February 19, 2006 and is operated by Stadt Freudenstadt. It got 117146 visitors since then. Shouldn't this webcam work or should the link be wrong please report that here. You can add this webcam here to myCams.